After a short and enjoyable stay in Tokyo I headed to Shinjuku station to take the airport limousine bus. Around 40 minutes later I was dropped off at Haneda terminal 1. The terminal can be a little confusing, it is separated into different wings depending on where you are going within Japan. I was perhaps looking a little bewildered when a very polite JAL staff member approached me and asked if I needed any assistance. After I told her I was flying to Osaka she pointed me in the direction of the other wing. I found the premium counters for check-in and met another polite and friendly JAL employee. I inquired as to the availability of a 'Class J' upgrade as I was only booked in economy. She told me she was able to offer me a seat for 1000 Yen. It's a bargain in my opinion and I snapped it up immediately. I paid by credit card and my bags were checked with priority tags and a boarding pass for seat 2K offered. The whole process was so simple and handled just perfectly, it never ceases to amaze me how efficient and polite Japanese customer service staff are. Once check-in was complete I headed through security. There was no waiting at all and I was through in a matter of seconds. Since I had a bit of time up my sleeve I decided to wander around and do a bit of plane spotting. The food offerings in the terminal are fairly poor I thought, I ended up with a toasted katsu pork sandwich. I had been craving a western brand for some reason, but there is nothing around like that. I decided to head up to the lounge. There is 2 lounges depending on your status, for oneworld emerald's you can use the 'Diamond Premier Lounge'. Let me tell you though - there is nothing 'Premier' about it. But the food and beverage offerings are terrible. There is basically no food at all other than some tiny snacks. Certainly not at the standard we are used to in Australia, definitely not at the Asian standard and I think even worse than American lounges. It was disappointing indeed. I ended up leaving after a short while and heading down to the gate. Soon enough it was time to board JL113, the 10.30 am to Osaka. One of dozens of flights operating this route every day! With a gentle bow I was welcomed on board and directed to the right hand side of the cabin and seat 2K of this 'Class J' cabin. For those who do not know, in Japan there is 3 classes of domestic service: Economy, Class J (basically premium economy) and First Class (basically business class). On the Boeing 767-300 only economy and class J are offered. The First class cabins are only available on certain routes and only on the B777 aircraft I believe. First class offers a meal service where as the other classes only offer beverages (non alcoholic at that). First class is available for about 8000 yen more than business, not too bad really. However for today I was on a B767 and Class J was as good as it gets. My aircraft today was almost 20 years old but the interior seems to have been completely refitted including the walls and overhead bins. They are fairly similar to those found on the B777 in fact. The seats are very good really, in a 2x2x2 configuration they offer extra width and pitch and a reasonable amount of recline in nice padded leather seats. Certainly a very pleasant way to spend a 45 minute flight. We pushed back and I watched the ground crew give us a bow and a wave as they send us on our way. I love that little Japanese tradition, they seem to do it in Korea too. We headed out to the runway that is built on a platform over the water.... very impressive! And soon we were on our way passing the lovely mountain ranges of Japan. There was one beverage run and I had a juice in a paper cup. Very basic but it's ok I suppose for such a short flight. Perhaps a small pre-packaged snack would be something they should consider offering, particularly in class J. It's worth mentioning as well that on board wifi is available at a reasonable cost. Just a few dollars covered me for this entire flight. I was having a great time chatting with my friends online about my trip. There is also some wireless streaming entertainment options, but as an English speaker those were fairly limited. As we commenced our descent the crew came around to collect everybody's paper cups, I was in fact offered another drink however I declined. I was also spoken to directly and thanked for flying JAL, perhaps in recognition of my oneworld Emerald status. It was a nice touch. After a smooth touchdown we headed over to the gate and everyone disembarked in a typical Japanese orderly fashion. I believe I was the only non-Japanese flying Class J on this flight, the rest of the passengers seemed to be Japanese business men and women. All in all a great flight. 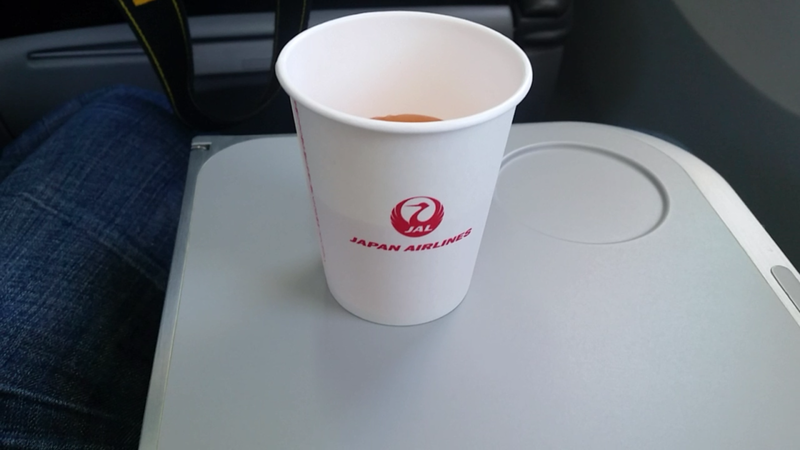 This was my first time on JAL and whilst they are quite similar to ANA really, I did thoroughly enjoy my experience. All the staff were superb and the seat was great, such a bargain considering the low cost of the upgrade. My only suggestion would be to improve on the food offerings both on board and in the lounges. This is my first comment here but I always read your blog, which is a pleasure to read! I have lived here in Japan for a year and a half now, and I usually fly JAL around the country as I am currently (and recently) a QFF Gold Member. I know JAL recently (2011) came out of bankruptcy so I hope they reintroduce food options (only First Class on 777-200 domestic flights get them) in all classes, but sadly, I don't see them doing that soon. Having said that, service, as you said it, is superb. Hi thanks for leaving a comment, and thanks for reading! You are right about the Qantas status credits, its a very good deal. I believe the domestic fares in Japan are reasonably high so I think a small snack should be offered.